I went to the Maasi Mara to photographed herds of zebras. Then to the mountains of Samburu, where I saw a spectacular fight between two Grévy zebras who were fighting to be the dominant stallion. The fight lasted 15 minutes with loud braying, barking and snorting sounds. Finally they calmed down, and with their tails in the air, they galloped away. Later I travelled to Nanyuki where a herd of Burchell zebras were spooked and they came thundering past my jeep. I was covered in dust and mud and only managed to take a photograph of their striped bottoms disappearing across the grassy plains. It was interesting to see the difference between the Burchell, Grévy and Mountain zebras. I had to check the shape of their ears and the different pattern of their stripes. 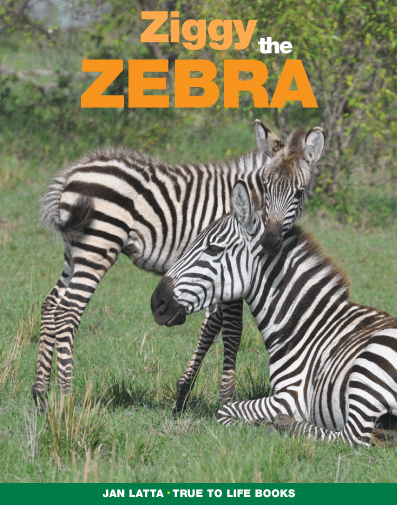 The concept for the book is the zebras talking to children about its life in the wild and how it can survive. There are maps, interesting facts and fun activities. See this video of zebras in the wild.